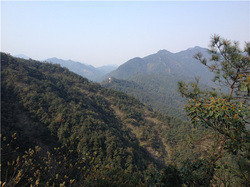 Another hike route around Five Waterfalls area in Zhuji but this time we explore another part. We will hike along a trail to the South Gate of Five Waterfalls and then into the Scenic Area by boat, enjoying the beautiful reservoir followed by visiting an old Buddhism temple and Eastern Valley. It's a new route in 2016 and think it'll be as popular as our old Five Waterfalls hike trip! 08:25 – 09:49 Board train G1337 for Zhuji; Arrive at Zhuji station, picked up by chartered mini van, and transfer to Zhuji Zilang Village (+/- 40 min). 17:52 – 19:18 board train G1356 and return to Shanghai Hongqiao Railway station.